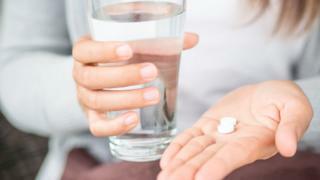 UK scientists have taken the first steps towards creating new vaccine treatments in pill form. The Cardiff team has made a prototype oral flu vaccine, which unlike standard inoculations does not need to be stored in a fridge or freezer. They hope it could pave the way for needle-free inoculations for lots of different diseases that would be easier to use in developing countries. However, they said more work was needed before it could be tested in people. Traditional biological vaccines work by introducing a safe form of a virus or bacteria - or a harmless part of it, such as a peptide - in order to provoke an immune response in the body. This allows the body to recognise an illness, such as flu, and deal with it more effectively should it ever encounter it for real. But the difficulty with these biological vaccines is that they need to be frozen or refrigerated throughout transport to keep them stable, making them costly and difficult to deliver in countries without a reliable electrical supply. For this new influenza-A vaccine, scientists at Cardiff University created man-made peptides that mimic those in real viruses. Unlike the biological peptides, these "mirror image" molecules cannot be digested, opening up the possibility for them to be administered in pill form. The study, published in the Journal of Clinical Investigation, found the prototype triggered a strong immune system response in human cells when tested in a culture dish. And it was as effective as the standard biological influenza peptide when tested in mice. It was also shown to generate cells that kill the influenza virus when it was given orally to the mice. Prof Andrew Sewell, from Cardiff University's school of medicine, who led the study, said: "There are many benefits to oral vaccines. "Not only would they be great news for people who have a fear of needles but they can also be much easier to store and transport, making them far more suitable for use in remote locations where current vaccine delivery systems can be problematic." However, researchers acknowledged that much more research was needed to develop these synthetic vaccinations for the entire population and for other diseases. They added it was likely to take several years before such a vaccine could be tested in people. There is another oral vaccine already in existence - oral polio vaccine - but that needs to be stored in a freezer. Zania Stamataki, senior lecturer in viral immunology, at the University of Birmingham, said: "This important novel approach to vaccine design could change vaccine development against multiple diseases, particularly those infecting hard-to-reach populations affected by natural disasters or war." Divya Shah, from the Wellcome Trust's infection and immunobiology team, said the "exciting" study provided "a potential route to make synthetic vaccines that are heat stable and could be taken orally". "However, much more research is needed to translate the findings into real-world vaccines." Jonathan Ball, a professor of molecular virology at Nottingham University, said: "It will be important to see if the peptides can still protect against infection when administered by mouth, and equally crucial to see if they work in humans, but it's an exciting first step nonetheless."